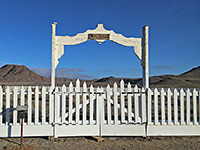 The military base of Fort Churchill was the first to be established in Nevada (in 1860), and the largest, though was in use for a relatively short time, nine years, being abandoned soon after the end of the Civil War. 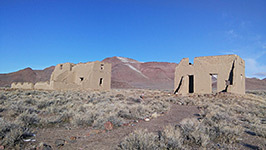 It was built mostly to suppress uprisings by the local Bannock and Paiute tribes, as well as to provide general assistance to emigrants bound for California, and mediate in disputes over mining rights and land ownership. Also located here was a station along the Pony Express mail route, and this building survives intact. The fort itself is rather less complete as many of the structures are totally gone; significant ruins of 15 remain, stabilized following acquisition of the site by the state, in the early 1930s. All are roofless though some are still mostly complete up to ceiling level, while others consist only of fragmentary wall remnants. The fort is protected as a state historic park, to which entrance (2019) is $5, paid via the envelope system as the place is often unstaffed. Other facilities are a 20-site campground, a picnic area and several trails along the river. 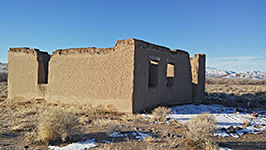 Fort Churchill State Historic Park has a remote yet scenic location in an uninhabited section of the Carson River valley, just off ALT US 95 and 9 miles south of Silver Springs on US 50. To the east, the river flows over the flat land of Churchill Valley, where it is impounded to form Lahontan Reservoir, but to the west it is contained within quite a narrow ravine, enclosed by barren hills, snow-covered for several months during winter and spring; Churchill Butte to the north, and the Pine Nut Mountains to the south. Fort, valley and hill (and county) are named after Sylvester Churchill, Inspector General of the US army. The buildings are situated on the north side of the river at the mouth of the valley, which narrows downstream (west) and is followed by an unpaved road, connecting with Dayton further along US 50, near Carson City. The fort has a traditional rectangular layout, with a central quadrangle lined by rows of buildings on each side. The stage station is one mile east, along US 95, while the campground is to the south, in partly wooded land near the river, adjacent to a railway branch line. 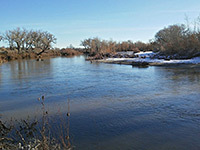 In 1994 the park acquired a corridor of land further east, either side of the river, known as the Carson River Ranches; this connects the fort to Lahontan State Recreation Area. One point of interest along the approach route to the fort is the old cemetery, a small plot of land enclosed by a white picket fence. All soldiers buried here were removed in 1884, their remains transferred to Carson City (the Lone Mountain Cemetery); now the only occupants are Samuel and Eliza Buckland and five of their children who died young. The Bucklands bought the abandoned fort in 1869 and built a ranchhouse nearby, a building that also served as the stage station, replacing an earlier structure. The two story house contains 19 rooms and was largely built using timber salvaged from the floors and roofs of the fort buildings. The station is on the east side of US 95 adjacent to the Carson River, and is linked to the fort by a riverside path, the Orchard Trail. The fort is circled by a loop road, which has spurs to the campground and to day use areas near the river. The main parking area is at the visitor center/museum, on the northeast side. The ruins are viewed by walking along a half mile path around the quadrangle; visitors are requested not to leave the trail in order to avoid potential damage to the structures. All the brick and adobe buildings look rather similar, lacking any individually distinctive features, though information plaques in front of most of them explain their various functions. The east side of the quadrangle has the most complete buildings; from north to south they are the post headquarters, quartermaster's storehouse, subsistence storehouse, laundress's quarters (this a little further from the path) and the hospital, an L-shaped building. To the south are the magazine (ammunitions store) and guardhouse, while all of the west section contains barracks blocks. Along the north side are four minor foundations and two larger remains, all officers' quarters, and all originally of two storeys.